The Scottish Rural Parliament in 2016 brought together 350 people from across rural Scotland to discuss the issues of greatest importance to rural communities. This year’s rural Parliament in Brechin saw an increase in island representation. 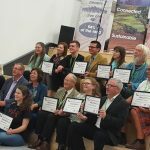 Not only the Scottish Islands Federation held its own workshop as part of the Fringe, but a sizeable proportion of the prizes for social innovation also went to islanders. Yet again another example of of islanders showing that they are smart. Islanders from Barra, Mull , Skye and Shetland among the winners. A Manifesto for Rural Scotland was agreed with participants deciding what actions need to be taken and by who, to ensure our rural communities are empowered, connected and sustainable. The final Manifesto and Action Plan will be published shortly on the Rural Parliament website. The four subjects prioritised by participants were: Land, Local democracy & governance, Business and Broadband and mobile phone signal. The Scottish Islands Federation asked for the situation of islands to be considered in a number of the manifesto’s paragraphs. Much like legislation after the island Bill is passed, the manisfesto needs to be island proofed. The site visits were all inspiring and and there a was visible buzz about the place. People genuinely felt they could express themselves and be heard. A lot of connections were made. The Scottish Rural Parliament did feel like it presented a genuine opportunity for communities to make real and positive changes where they live. There was a real buzz about the event. The main concept of the Rural Parliament is that it is a participative event., where rural people can talk face to face to politicians and policy makers. It is a welcome sign of democracy in action.